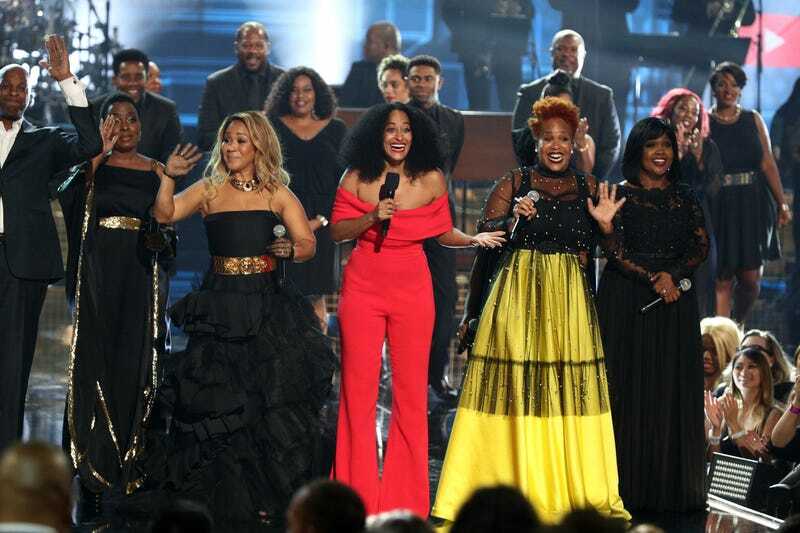 (L-R) Erica Campbell of Mary Mary, Tracee Ellis Ross, Tina Campbell of Mary Mary, and CeCe Winans speak onstage during the 2018 American Music Awards at Microsoft Theater on October 9, 2018 in Los Angeles, California. Real talk? We knew what the 2018 American Music Awards were gonna be about before the first statuette had even been awarded. The intention of the evening was made clear the second it was announced that Taylor Swift only needed three more wins to unseat the much-beloved late, great Whitney Houston as the female artist with the most wins in AMA history. Tracee Ellis Ross performs onstage during the 2018 American Music Awards. Moving on: Just in time for cuffing season, Ella Mai got the crowd adequately “Boo’d Up” (not this writer’s jam, but I admittedly bopped along with the audience); Khalid and Halsey showed us what the kids are into these days; Latina Camila Cabello continued her banner year with a lovely ballad; and Mariah Carey and J.Lo both let us know they’re still firmly in the game (and hopefully, Mariah knows J.Lo now). Cardi B performs onstage during the 2018 American Music Awards. But the best performances of the night were both high-octane. First, Cardi B staged a full-on Afro-Latina technicolor street party to perform “I Like It Like That.” Later in the telecast, Ciara effectively reminded us why she was once touted as Janet Jackson’s successor with a perfectly percussive rendition of “Level Up.” Granted, I’m still trying to wrap my head around “yummy all in your tummy” as a viable pop lyric, but Ciara did that. Good thing there’s room for both to be great (we’re talking to you, Cardi and Nicki stans). Missy Elliott (L) and Ciara perform onstage during the 2018 American Music Awards. And in a wisely gospel-focused tribute to Aretha Franklin, the 2018 American Music Awards ended with a medley of gospel classics. Gladys Knight, Donnie McClurkin, CeCe Winans, Ledisi and Mary Mary all took the stage to sing arrangements made famous by Franklin on her 1972 double-platinum album, Amazing Grace. The performances were, of course, stellar, but honestly, if the Aretha montage that preceded it didn’t tear you up, you should just head straight to church, because you’re already lacking soul. Oh, yeah, some people other than Taylor won awards, too. For instance, Offset and Cardi took home his-and-hers statuettes, thanks to his win with Migos (Cardi actually took home three). The highly controversial and recently slain XXXTentacion won a posthumous award for Favorite Album, Soul/R&B for 17, which his mother accepted on his behalf. And while the Shiggy Challenge couldn’t keep Drake from being shut out (it clearly just wasn’t God’s Plan this year), black and brown folk took home wins in over half of the 29 categories—including a win for the Kendrick Lamar-helmed Black Panther soundtrack. In fact, we even came through in the country category this year, as newcomer Kane Brown brought home not one, but three crystal statuettes in the category, including Favorite Album and Favorite Song. Kane Brown poses in the press room during the 2018 American Music Awards.